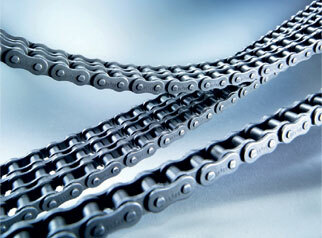 iwis has developed a new lubricant for roller and conveyor chains. Sold under the Elidur brand, the high- performance lubricant was developed especially for Elite chains to replace the current initial lubrication of all standard roller chains up to 32B or ANSI160. It is reported that manufacturer’s tests have shown that the optimised blend of wear additives improves the service life of Elite roller and conveyor chains by up to 250%. As well as improving the chains’ wear lifespan and minimising elongation during run-in compared to conventional long-term lubricated chains, the new lubricant has very good adhesive properties, provides good corrosion protection, reduces chain noise and is compatible with other lubricants. Elidur is a mineral oil based chain oil with additives, is water-insoluble and non-toxic. It can be used in temperatures ranging from -5 to +120 ̊C. Its kinematic viscosity is 460cSt (centistokes) at +40 ̊C.